In the field, students learn by doing. They readily absorb concepts difficult to teach in a traditional classroom, such as how to set up a transect, obtain tissue samples from wildlife, or observe animal behavior using professional standards. They experience what the land smells and feels like—and discover clues to the workings of an ecosystem. Their direct observations enrich lectures and textbook readings. Being outdoors lets students witness for themselves the importance of ecological relationships, and the interconnectedness of species. More than 150 undergraduate courses across the UC system visit NRS reserves each year. Class subjects range from botany to zoology, archaeology to environmental planning, public health to the performing and visual arts. Reserves welcome university-level courses on virtually all topics of study; photography and outdoor writing are considered as valid as the natural sciences. Institutions from around the world bring their classes to the NRS to learn. 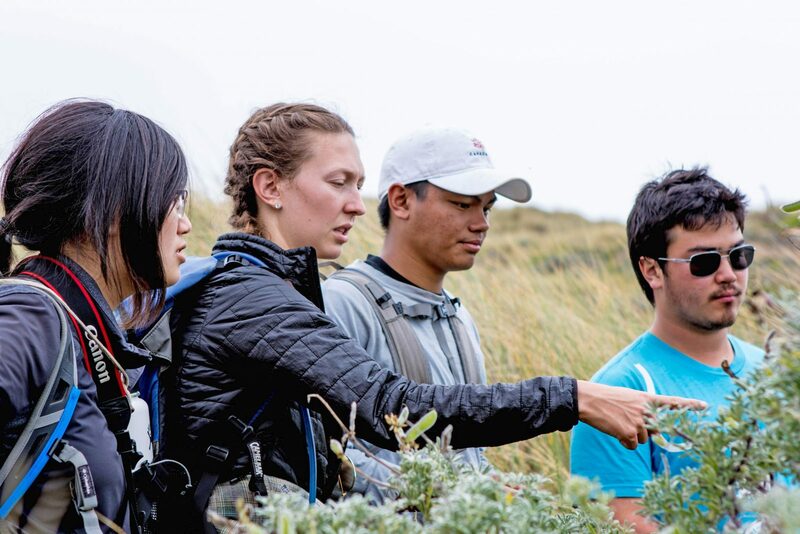 Spend seven weeks living and studying at NRS reserves, experiencing a cross section of California habitats ranging from rocky coast and freshwater marsh to oak savanna, conifer forest, and desert. Gain field research skills and learn techniques for studying plants, animals, and ecological communities. California Ecology and Conservation is open to undergraduates from all general UC campuses. A maximum of 27 students are accepted per term. Course yields a full complement of quarter or semester units. One of the primary uses of NRS reserves is hosting classes on topics ranging from ecology to botanical drawing, field methods to geology. Reserves are particularly valuable for teaching because most are protected from disturbance and closed to the general public. Apply to bring your class to a reserve through our Reserve Application Management System (RAMS). If your application is approved, you will be able to make a reservation through the RAMS system for your group to visit on a given date and to use particular facilities.